Since its inception, Facebook has linked to user profiles through randomly assigned numbers in the URL (e.g., “http://facebook.com…id=592952074/”). While effective, the method has not allowed users to easily share links to their profiles with others. When copying and pasting a link was the main option, users often found themselves sifting through Facebook search results in order to find the right profile. Finally, this Saturday, June 13th, at 12:01 A.M., this will all change. 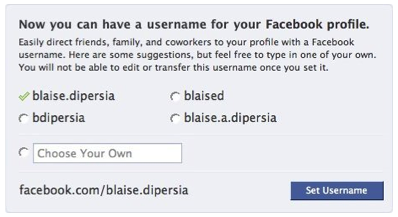 Facebook users will have the opportunity to choose usernames in order to create unique vanity URLs, making profile sharing easier than ever. One minute after midnight, the site will invite its 200 million users to either choose from a list of suggestions (all of which are a combination of a first and last name), or to create an original name. Social media addicts and those with common names will need to be diligent as usernames will be available on a first-come, first-served basis. Once facebook.com/jsmith has been claimed, all other J. Smiths hoping for that URL will be out of luck. Users will also need to think carefully and strategically about their vanity URL choice, because once applied, they will not be able to alter their selections. In other words, think twice before rushing to grab “xXRockerJamesXx” first. Facebook not only blogs about the new vanity URLs, but also provides users with a link to a live countdown.